The Carp is regarded as the Chinese national fish. Chinese people endow the Carp fish with rich cultural connotations that express beautiful wishes through its symbolism and iconography. In 2018 "a carp fever" swept China's social medias, and many kinds of carp imageries and topics flooded the Internet. "Forward the Carp for good luck" became very popular among Chinese Netizens. The Chinese carp eats microorganisms and phytoplankton, and as an ecological utility it was introduced to many other countries to purify water quality. However, due to its strong adaptability and fertility, the Chinese carp over-populated and caused local ecological imbalances. Nowadays people try to fish Chinese carps in an attempt to reduce its population. "Everyone is a fish in the river of time". 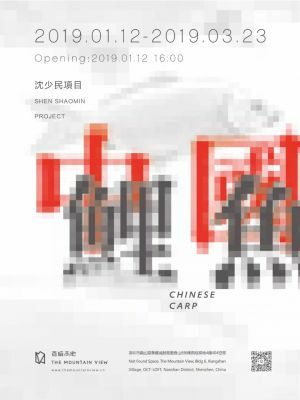 In the entertainment and commercial fields, the Carp has become the special icon that crosses ancient times to modern days, connecting traditional and contemporary within the era of big data and the Internet of Everything. In this project, the artist combines electronics and silica gel to replicate and simulate 2000 mechanical carps faintly breathing and struggling in an endless white salt flat. This magical scene will evoke in the audience boundless imagination and perspectives of thoughts towards the Chinese carp and its rich symbolism. Shen Shaomin is a contemporary artist, living and working in Beijing and Guangzhou, China and Sydney, Australia. Notable artworks span installation, video, documentary film, conceptual painting, poetry, and interactive public art, among other formats. Participation in many influential international exhibitions, including: Art Basel Hong Kong "Encounters" (2017); Busan Biennale (2016, 2012); First Kiev Biennale (2012); Guangzhou Triennial (2012, 2005); Shanghai Biennale (2012); Sydney Biennale(2010); and the Liverpool Biennial (2006)...Recent large-scale solo projectsinclude: "THERE IS NO PROBLEM", Guangzhou Redtory Museum of Contemporary Art(2015). Documentary films: "I AM CHINESE" and "ONE MONK TEMPLE" . ShenShaomin’s works can be found in the collections of many renowned artinstitutions and private individuals worldwide.